Loops constitute between 60 and 70 per cent of the patterns encountered. In a loop pattern, one or more of the ridges enters on either side of the impression, recurves, touches or crosses the line of the glass running from the delta to the core, and terminates or tends to terminate on or in the direction of the side where the ridge or ridges entered. There is one delta. On the right you will see a loop pattern. You will notice that it has one delta (shown in the blue box) and a core (shown in the red box). By definition the existence of a core and one delta makes this pattern a loop. Loops are classified not only by the fact that they have one delta and one core but also by something called a ridge count. Loops are two kinds, ‘radial’ and ‘ulnar’, named after the radius and ulna, the two bones in the forearm. The radius joins the hand on the same side as the thumb, and the ulna on the same side as the little finger. The distinction between Ulnar and Radial loops depends on which hand the loop is found on. In the image at left the core pattern area (noted in red) tends to come in from the left and go back out the left. Hold your left hand up to the screen and note that your little finger is on the left, which is the direction that the pattern tends to come in from and go back out to. Since this is towards your little finger, and by virtue of that towards your Ulnar bone in your arm, this makes the loop an Ulnar loop. Now, if you were to place your right hand up to the screen and make the same comparison you would find that the pattern area now tends to come in and go out towards your thumb. It so happens that the radial bone in your arm is on your thumb side so now this loop would be considered a radial loop. Obviously to make the distinction between these two types of loops you have to know on which hand they appear because if a loop pattern is an Ulnar loop on the right hand, then by default it will be a Radial loop if found on the left hand. Radial loops are not very common. Most of the time if you find a radial loop on a person it will usually be on the index fingers. Between 25 and 35 per cent of the patterns encountered consist of whorls. In a whorl, some of the ridges make a turn through at least one circuit. 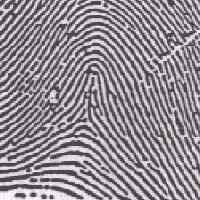 Any fingerprint pattern which contains 2 or more delta’s will be a whorl pattern. In the scheme of classification you can make the assumption that if a pattern contains no delta’s then it is an arch, if it contains one (and only one) delta it will be a loop and if it contains 2 or more it will always be a whorl. If a pattern does contain more than 2 delta’s it will always be an accidental whorl. As with any whorl there must be more than 1 valid delta or else it is a loop. If you look at image A you should be able to identify the two delta’s. If not then look at imageB and you will see that they are displayed in the red boxes. 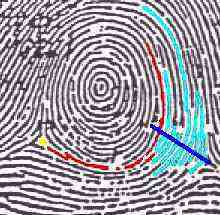 The technical definition of a plain whorl is a whorl which consists of one or more ridges which make or tend to make a complete circuit, with two delta’s, between which an imaginary line is drawn and at least one recurving ridge within the inner pattern area is cut or touched. Notice the inner area of the pattern, that is the area which tends to form a circle? This is what you would call the inner pattern area and it is what make a whorl look like a whorl. Okay, now looking at the specific ridges that are making or trying to make the circle lets say we were to draw an imaginary line between the two delta’s (the red line in image C) then we can see that this line does intersect the same lines or line that tend to form the circle. Alright now lets take a closer look so maybe this will become more clear about what is sufficient and what is not sufficient to be a plain whorl. Take a look at image D and you can see the inner pattern area in yellow that forms or tends to form the circle part of the loop. Notice now that if we draw a line from delta-to-delta we do not intersect the lines that are forming the circle? 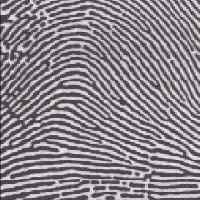 The same thing is true for image E. Take a look at image E and see if you can determine the inner pattern, that being the ridges that form or tend to form a circle. Can you see that if a line is drawn again from delta-to-delta that no lines that form the circle are intersected? Now look at image F and see if you can identify the ridges that are forming or tending to form the circle or inner pattern. Notice now that when we draw a line from delta-to-delta that this inner pattern, or the lines forming the circle are intersected? Image D and image E are examples of Central Pocket whorls. 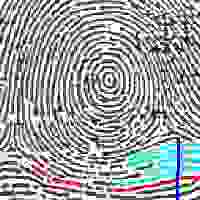 Image F is a plain whorl. This is the first part of identifying a particular whorl. In this process we merely identified the pattern type. In this case we have identified what it takes to be a plain whorl. A central pocket whorl consists of at least one recurving ridge, or an obstruction at right angles to the line of flow, with two deltas, between which when an imaginary line is drawn, no recurving ridge within the pattern area is cut or touched. If you look at the pattern area of the three images at left you will notice that the actual lines that make a “circle” are very close to the centre and there are not very many of them, in fact only about two or three on Image G and about the same on image H.
To make the determination of the type of pattern we must draw an imaginary line between the two deltas that appear on the print. In image I I have drawn a red line to act as the imaginary line between the two deltas and if you study this you will see that the ridges that form the inner pattern are not crossed by this imaginary line. This makes it a central pocket whorl by definition. If the ridges of the inner pattern were crossed then this would be a plain whorl. Lets looks at some comparisons between a central pocket whorl and the other types: When compared side-by-side the differences become a little more obvious. If you look at image G you can see that the imaginary line (in red) does not cut across any ridges which form the inner pattern area. 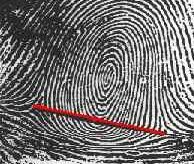 But if you look at image H you can see that the imaginary line does, in fact, cut across the inner pattern area (or the ridges which form or tend to form a circle). The pattern in image I might at first glance be taken for a plain whorl because if you were to draw the imaginary line it would cut the pattern area, but you will notice there are two core area’s in this pattern, which are shown by the red pointers. Because of the two cores this pattern is a double loop whorl. A double loop whorl consists of two separate and distinct loop formations with two separate and distinct shoulders and two deltas. The technical definition for this pattern type is fairly straight-forward. There must be to separate and distinct shoulders for each core. If you look at images J and image K you can clearly see that there appears to be two separate “loops” inside of this whorl. In most cases this means that the pattern will most likely be a double loop whorl but not always. The problems lies in the “separate and distinct” shoulder requirement sometimes. If you look at image L you can clearly see that there are separate and distinct shoulders created and shown in the red and blue. The shoulders of each “core” must comprise separate lines. This means that they can’t be the same obviously. By using a little creative editing I have now changed image L and the way it appears in image M. The significant change is that I have edited this image so that both apparent shoulders (cores) now use the same line (indicated in red). Because they both now use the same line to form the shoulders of each core this is no longer a valid double loop whorl. If there is a problem with identifying a double loop whorl it is probably because of the failure to either identify that there is a separate and distinct shoulder to each core. If the shoulder is formed by the same recurving line then it is not valid. Another issue comes into play and that is if the core or shoulder is actually valid itself. 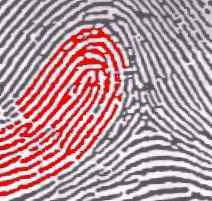 Arches represent only about 5 per cent of the fingerprint patterns encountered. In arch patterns, the ridges run from one side to the other of the pattern, making no backward turn. There is ordinarily no delta, but where there is the appearance of a delta, no recurving ridge must intervene between the core and delta points. Arches come in two types, plain or tented. Arches by definition have no delta’s. If the pattern has a delta then it is a loop and if it has more than one delta it is a whorl. If you don’t have a clear understanding of what a delta is then jump to the pattern types page so that you can better understand them. You will notice in the image at right (plain arch) that there is no delta and no significant core. Because there is no delta this pattern, by default, has to be an arch. If you study the image and look at the overall pattern you notice that the pattern area tends to just flow through the print with no significant changes. This makes it a plain arch pattern. If you compare the two images, plain arch and tented arch, you can see that while the plain arch tends to flow rather easily through the pattern with no significant changes, the tented arch does make a significant change and does not have the same “easy” flow that the plain arch does. The technical definition is that a tented arch has a “significant upthrust” where a plain arch does not. If you study this image long enough you might say “wait there appears to be a delta in there and it can’t be an arch with a delta!!”. Well you are partially correct in that yes, you could see a delta in this print (three sides of the triangle) but here is why it is not a valid delta: To be a valid delta there has to be a significant recurving line which passes in front of the delta, and in this case there is not. In a little simpler terms here is why this can’t be a loop, which it would be if it had a valid delta. If you considered the “almost delta” which appears in the near centre left side of the pattern, and you attempted to get a ridge count then the ridge count between the delta and core would be “0”. You cannot have a loop with a “0” ridge count. If you call something a loop and then when you try to get a ridge count you come up with “0” then it is not a loop but rather a tented arch, more than likely. There is an even flow of ridges from one side to the other of the pattern. This arch approximates the loop type, where there is a delta or the appearance of a delta and the ridges slop towards the thumb. It may have a delta and no recurving ridge, or a delta that is part of a recurving ridge, but when both these features appear in a pattern, there must be no ridge count between the core and delta points. The ulnar arch has the same characteristics as the radial arch except the ridges slop towards the little finger. In patterns of the tented arch type, the ridges near the middle have an upward thrust, arranging themselves, as it were, on both sides of a spine or axis, towards which the adjoining ridges converge. The ridges thus converging give the appearance of a tent in outline. In order to differentiate clearly between tented arches and those loops whose ridges are more or less vertical if on either side of the axis even one ridge recurves, it is classified as a loop. When a pattern consists of a small ridge only with an upward thrust, the extent of the upward thrust of the enveloping ridge immediately above the central spine determines whether it is a tented arch or not. The enveloping ridge at this point must have a distinct tent-like appearance. When a pattern has no spine but instead a ridge forms the distinct tent-like appearance, then it should be classified as a tented arch. Where the pattern consists of loop formations, thereby giving equal claims to radial and ulnar loops, with or without a central spine of axis, it is classified as a tented arch. Under this heading are the relatively small number of patterns too irregular in outline to be grouped with central pocket loops and double loops. They have two or more deltas and a combination or fusion of two or more types of patterns not including the plain, radial or ulnar arch. This category also includes any freak pattern or accidental formation that does not conform to any conventional type. There are two components of a whorl classification. The first is the whorl pattern such a plain, double, central pocket and the second is the tracing. The tracing is relatively simple once you understand it. The key is understanding it. 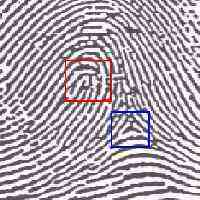 In the image at right we see a plain whorl pattern. 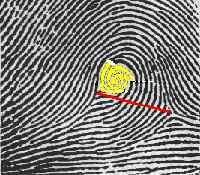 To determine the tracing we must 1st identify the left delta which has been marked in yellow on the left side of the image. Now, from the left delta (in yellow) we follow the 1st line below the delta across the image until we reach a point that is directly below the right delta. To simplify this I have drawn a blue line from the right delta down to signify this imaginary line. 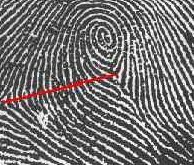 The red line signifies the tracing of the line across the image. Once these lines stop the point where the red and imaginary line (in blue) meet, we then count the number of intervening lines that are intersected by the imaginary line (the one in blue). The intersecting lines are noted in the light blue colour and if we count them we come up with 6 intervening lines. There are three types of tracings, outer, meet and inner. Outer means that there are 3 or more intersecting lines and they are outside of the pattern area. In this case we had 6 lines and they are outside the pattern area therefore this tracing is an outer tracing. If the number of intersecting lines (the ones in light blue) had been three or less, then this would have been a meet tracing. Now lets take a look at image O at left. In this image we again take the left-most delta and begin following a line until it intersects an imaginary line (in blue) with the right delta. The we count the intersecting lines (those in light blue) and we find that there are 8 intersecting lines. Remember the only thing we are looking for is 3 or more lines. In this case there is more than three and this time the intersecting point is inside the pattern area. This makes this an inner tracing. Again if the imaginary intersecting line is within 3 intervening lines of the right delta when counting across an imaginary line, then it would be a meet tracing. More than 3 to the inside of the pattern area makes it an inner tracing and more than 3 outside the pattern area make it an outer tracing.